Devin B. Johnson "Poly-Ethnic (Crenshaw Square)." 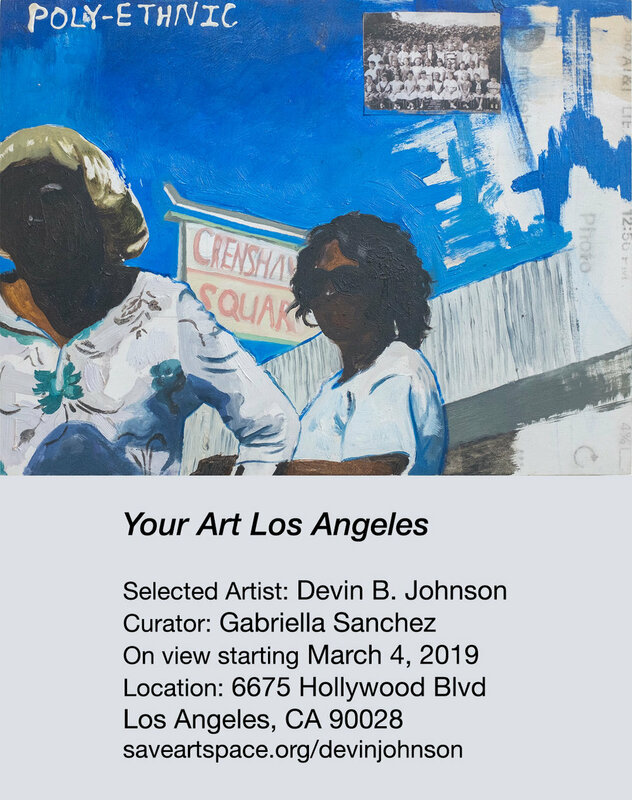 Devin's artwork will be on view at 6675 Hollywood starting March 4 and will be on view for at least one month. Devin B. Johnson is a multi-disciplinary artist living in Brooklyn. He works primarily in the language of painting. Johnson’s work is based on the decoding and reassembling of socio-cultural structures. He often draws from sourced images, urban landscapes, and a lexicon of familiar experiences. Johnson combines examinations of the black aesthetic, through gestural mark making and uncanny imagery. The paintings are an amalgam of exterior and interior moments of black bodies in rest or leisure. The paintings are labored to mimic corrosion of facades in which moments of reveal take place. His compositions speak to the fragmented nature of memory and how it is reshaped when its revisited. Those tactile moments in the landscape are often negotiated within paintings, sculptures, sound and mixed media collages. Devin B. Johnson was born in Los Angeles, California, 1992. Johnson obtained his BA in Fine Arts from the California State University of Channel Islands in 2015 and will receive a Masters of Fine Arts at Pratt institute in 2019. He has showed in various group shows across Los Angeles. Recently he showed with Residency Gallery in Los Angeles for The New Contemporaries (2018) group exhibition and has participated in ICA LA’s Incognito (2018) benefit sale. Devin B. Johnson was awarded the recent honor of being featured in this years Northeast issue of New American Paintings. Connect with Devin on Instagram at @Devinbjohnson. Gabriella Sanchez (born 1988, Pasadena, CA) is a multidisciplinary artist working in her hometown of Los Angeles. Studying fine art, Gabriella received her BFA in 2011 from PLNU. Upon graduation she moved to Paris, France where she worked as a live-in nanny and freelance graphic designer in support of her fine art practice. It was at this time that she began to bring design elements such as typography and iconography into her artwork. Upon returning to Los Angeles in 2013, Sanchez applied and was accepted to several MFA graduate programs but in the end declined, instead concentrating on her work as both a designer and illustrator for clients such as NIKE, The White House (during Obama’s presidency) and Planned Parenthood. In 2016 she turned to painting as a way to fully integrate her design experience with her fine art sensibilities. Her work as a fine artist centers around the tension of duality and explores how meaning is created and received through both text and imagery. This is often done through a semi autobiographical lens and considers the impact of public narratives on the formation of identity. Sanchez has shown her work at CCCM: Mexican Center for Culture and Cinematic Arts, Charlie James Gallery, Jeffrey Deitch gallery (New York), Páramo Galeria (Guadalajara) and more. For fine art, gallery or other related inquiries please contact Gabriella at hi@gabriella-sanchez.com. Connect with Gabriella on Instagram at @_gabriella_sanchez.